The Professional Regulation Commission (PRC) already announced results of September 2013 LET (Licensure examination for Teachers) also known as teachers board exam. PRC and its regional offices now inform 19,384 new elementary teachers and 25,755 secondary teachers (LET Passers) for their schedule and venue of registration, oathtaking schedule as well as verification of ratings page. PRC has announced that registration for the issuance of Professional Identification Card (ID) and Certificate of Registration will start on December 6, 2013. 5) the Initial Registration Fee of P600 and Annual Registration Fee of P450 for 2013-2016. As results were released on Saturday, November 23, 2013, PRC said that the dates and venues for the oathtaking ceremonies of the new successful examinees in the said examination WILL BE ANNOUNCED LATER. Meanwhile, PRC Board News collates all the announcement made by PRC regarding oathtaking schedule and will be updated here once available. Post by The Summit Express. PRC Iloilo Passers - The OATH-TAKING Ceremony for passers of the September 2013 Licensure Examination for Teachers (LET) in Region 6 (Western Visayas) under the jurisdiction of PRC-Iloilo is on Thursday, Dec 12, 2013, 9 AM at Kalantiao Hall, Sarabia Manor Hotel. All passers are encouraged to attend, and be at the venue preferably at 7 AM for an orderly distribution of printed materials, including the Souvenir Program, the printing of which has been facilitated by the Board for Professional Teachers. 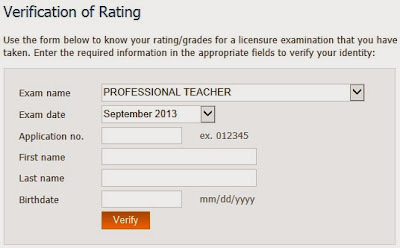 PRC online verification of ratings (VoR) page for September 2013 Licensure examination for teachers (LET) is now available. Select the Exam Name (Professional Teacher) and Exam Date (September 2013). Click Verify and that's it. PRC Board News assumes that ratings for every LET examinee of September 2013 exam is now available online as we can select the September 2013 exam date option for the required field at VoR. Good luck and hope that your rating for the recently concluded exam is high as you've expected.